ABOVE: An S-Bahn train arrives at Heidelberg Karlstor, the closest raiload station to the Altstadt. If you're coming from Mannheim and staying in the Altstadt, you'll probably be traveling on the S-Bahn RheinNeckar for the last leg of your journey--and if you're staying in the eastern half of the Altstadt, you may find it more convenient to continue past Heidelberg Hauptbahnhof to the Heidelberg Karlstor S-Bahn station, which is just east of the old town. To research train connections, use the Deutsche Bahn's English-language journey planner. The nearest airports to Heidelberg are Frankfurt International, Frankfurt-Hahn, Stuttgart, and City-Airport Mannheim (which has connections with a handful of German cities). From Frankfurt International, you can catch a high-speed ICE train to Mannheim and connect to Heidelberg by S-Bahn. Total travel time is about an hour. See the Deutsche Bahn journey planner for details. Other options include the Lufthansa Airport Shuttle bus and the TLS Transfer & Limousine Service. From Frankfurt-Hahn, the Hahn Express bus takes slightly more than two hours to reach Heidelburg. From Stuttgart Airport, take the S-Bahn to Stuttgart's Hauptbahnhof and connect to Heidelberg by train on the Deutsche Bahn. 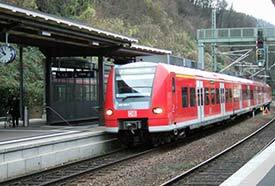 From City-Airport Mannheim, OEG tram #5 will get you to Heidelberg Hauptbahnhof in 25 minutes. The Heidelberg tourist office suggests arriving via Autobahn A5/A656 (Darmstadt-Karlsruhe/Basel), exiting at Heidelberg or HD-Schwetzingen. For detailed directions and parking information, see the tourist office's Web site. The RNV, a.k.a. Rhein-Neckar-Verhehr GmbH, operates trams and buses in Heidelberg and the surrounding region. Most lines stop at the Hauptbahnhof (main railway station) and/or the Bismarkplatz (a major shopping square and the gateway to the Altstadt or old town). If you're staying outside the center or plan to explore the city's surroundings, the HeidelbergCARD may be useful.